This image taken by the microscopic imager onboard the Mars Exploration Rover Spirit shows a close-up look at the rock dubbed "Humphrey." The image was taken after the rover drilled into the rock with its rock abrasion tool, exposing fresh rock underneath. The circled areas represent features that scientists have identified as being either natural or induced by grinding processes. 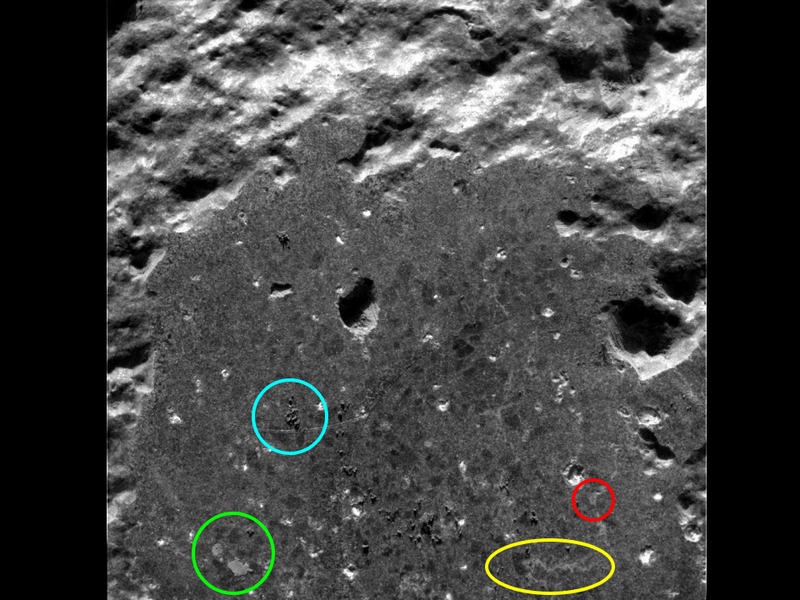 The yellow circle shows a natural mark; the green and blue circles highlights droppings thought to be left by the rover's Moessbauer spectrometer; and the red circle contains a natural indentation. The image was taken on the 60th martian day, or sol, of the rover's mission.